Wow, cool! Did you polish the edges somehow? Hi Pete. Excellent panel! It's good to see folks posting project photos. Thanks for posting. Scott. The edges were polished by the people that supplied the perspex. They were cheap as well, about £1.88 each sheet but did take a couple of weeks to get then back. They can supply to any size. Thanks for sorting the link out. Oh, so they cut to size - and then you drilled the holes? Do you also have LED indicators on your board? 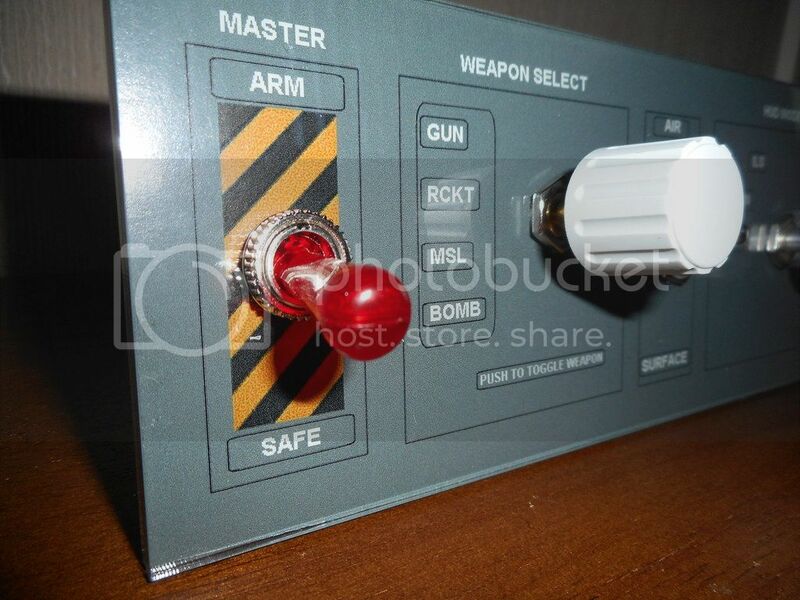 The Master weapon switch has an LED inside and it can illuminate, it is done by using a small relay, and supplied by 5 volts (Also from 'Rapid' electronics). Only good if you have a 5 volt supply handy of course. This one does not actually work yet, but I have a working one on a friends cockpit to good effect and we have also set up the cockpit lights to work in the same way using a relay contact as the input to the Leo Bodner card. The perspex was done by these people www.plasticsheets.com they also do 'tinted' colours and various thickness as well. I used a light grey tinted sheet and the graphic was also printed out in grey. I did get a dark grey tint as well but this was too dark for use as a front panel, you can not see through it at all but light grey is just right.